It is so very Happy!!! I love the red polka dot paired with the aqua cornerstones and low volume sashing, just fantastic!!! You share the best projects! Oh... the quilt is beautiful! Great finish! 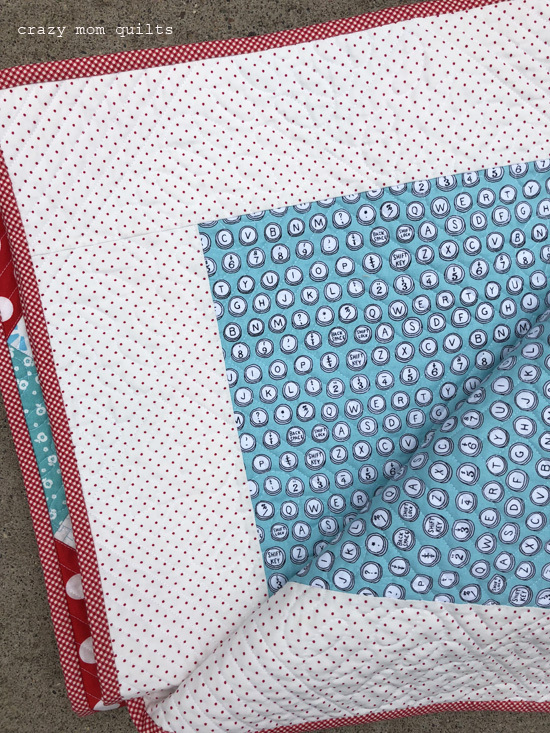 I love those polka dots and you're right, the gingham binding is perfect. Well worth all the time it took! 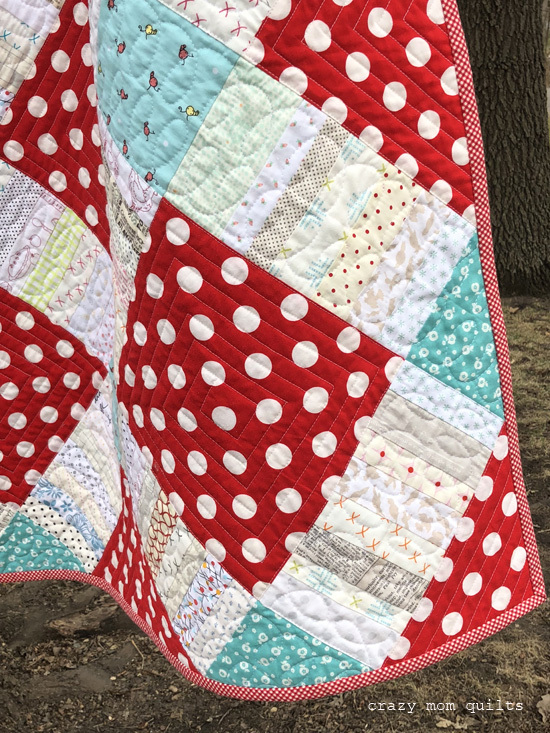 Nothing beats a finish, especially a fun and cheerful quilt! 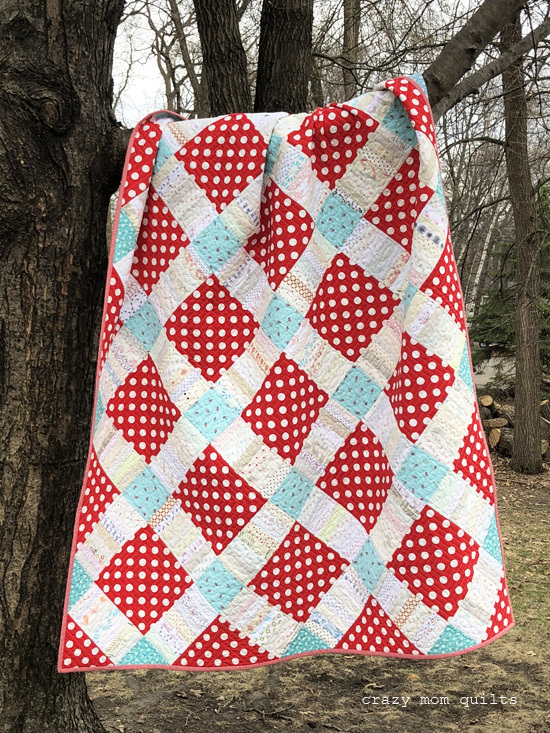 It is a cheery quilt and beautifully quilted! Red and aqua is a great combination. Now you've made me realise I haven't used gingham for quite a while and it does make brilliant binding!! It is a very happy quilt! And it's always fun to see the same quilt in different fabrics. It's amazing how different they can be. Great work on the quilting too! Just love those red polka dots! The quilt really pops. Great finish! Oh my goodness!, yes, a happy awesome quilt! I love it. Your completion reminds me that I never got started! haha I will tho' someday! My daughter is moving to my town! soooo that means we will burn it up in the sewing room together! Ohh I just love this, I have two or three quilts done in this colourway for my little girl and I just never tire of it....this pattern is on my to do list and I love how patterns can change so dramatically with different colour choices....that's why we keep making I think! 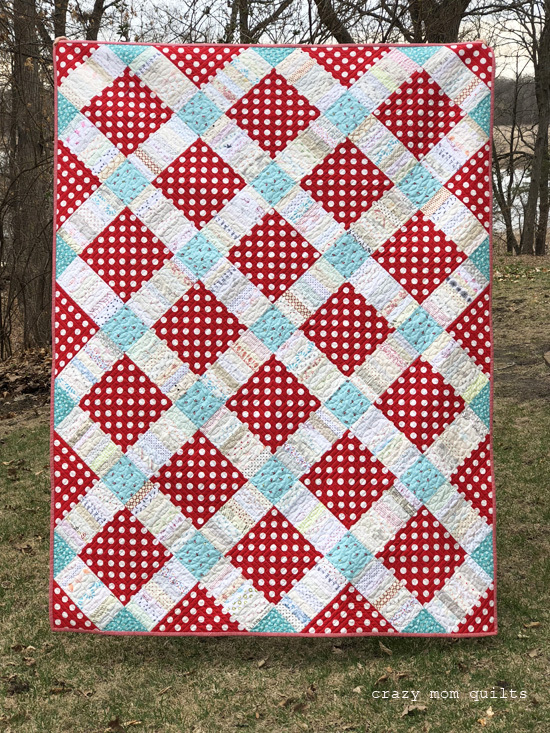 I fell in love with the June quilt with the green polka dots. Now I am swooning over the red and white bigger dots. Which to do, which to do?? Probably, I'll end up with the darker, brighter sashing since that is mostly my stash. Both of yours are wonderful! I love seeing quilts in different colorways. That was one thing I always loved and marveled at when I took a class to make a specific quilt. Everyone saw it differently. Both of yours are great. That last photo of the finished quilt - LOVE IT. Oh do I just love those red polka dots! This quilt is so adorable. I love how you find the greatest combinations. Fabrics I wouldn't think to put together just amaze me when I see them in your quilts. I participated in your QAL and had so much fun that I started another quilt. Now if I could just work on my own projects so I could see it finished. I can tell that I'm going to love it, too, and I haven't gotten very far. Thanks for sharing another colorway of your pattern. That is a super fun color combination! The neutrals make it a lovely quilt! Such a happy quilt! Very gorgeous !! i love it ! It's amazing how different a quilt can look with different fabrics. I love the brightness of it. It doesn't even look like a scrap quilt! That's incredible! I love the colors too. I could never hold out to do all of that quilting. Such a happy quilt. Made me smile just to look at it. Thanks for sharing. Gorgeous! Yes, I love to remake quilt patterns in different colours. I knew I'd seen this pattern before (I have your book) - this is another awesome version. Well done for using stash fabrics for it all. It IS a fun quilt. Ten hours of quilting is kind of crazy. 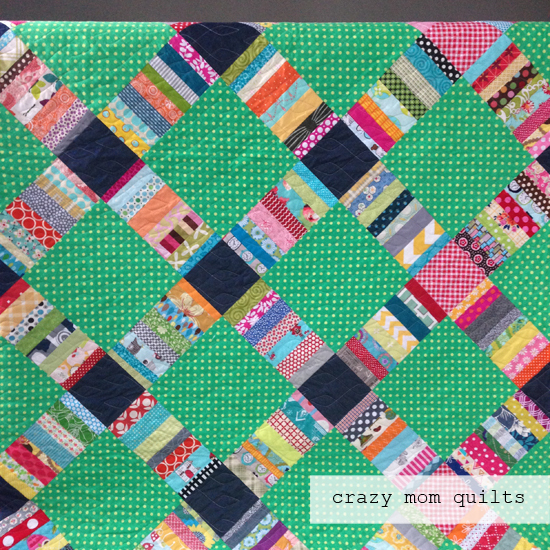 I guess you don't call your blog Crazy Mom Quilts for no reason. Love your quilt! I'm planning on making it myself. I'm busy gathering my scraps. 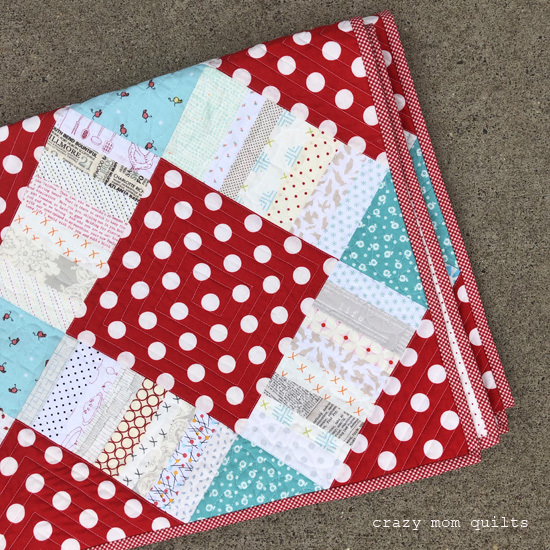 Have you considered trying Ruler Quilting on your DSM? It would have made the quilting in your squares much quicker. No marking and no turning your quilt constantly. Just move your ruler and sew in the next direction! I highly recommend Westalee Rulers by Sewsteady. Looks great in both colorways! Congrats on your finish! This Quilt is gorgeous, I really love the colours, the dots, the quilting, and the binding. It's just WOW.